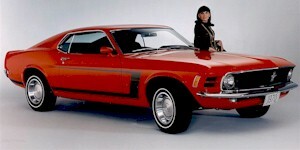 1970 The 1970 special model Mustang Grabber was a special package to promote the Grabber paint colors. They were all fastbacks painted in either Grabber Green, Grabber Blue, Grabber Orange, Calypso Coral, or Bright Yellow. The were optioned with the "Grabber Special Value Package". The Grabber Package included; the special "C" stripe which is similar to the 1969 Boss side stripe but without the lettering, the F-code 302ci 2bbl engine, body colored side mirrors, blacked out rear taillight panel, and 14-inch wheels with dog dish plain hub caps.